PRIVATE WiFi™, in conjunction with the Identity Theft Resource Center (ITRC), is sponsoring a contest for Facebook users to help remind them to keep their online identities safe. Four lucky winners will receive a yearly subscription to PRIVATE WiFi and one grand prize winner will receive an iPad 2! 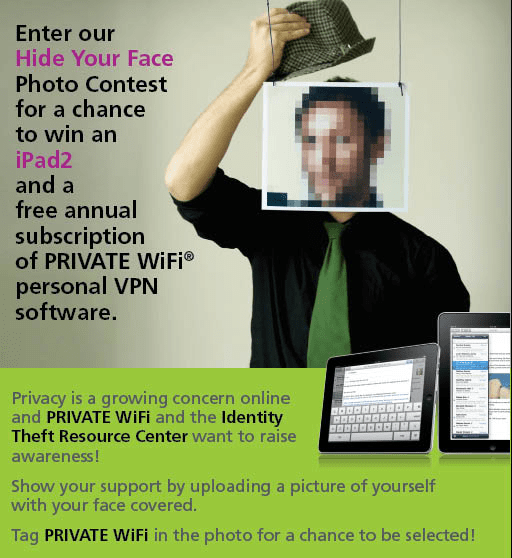 PRIVATE WiFi, a new and innovative company in the security software market, in conjunction with the Identity Theft Resource Center® (ITRC), is proud to announce its latest contest, called “Hide Your Face on Facebook.” This contest will run the entire month of October, which is National Cyber Security Month. This contest encourages Facebook users to go to the PRIVATE WiFi Facebook page and upload pictures that show themselves covering their faces in support of safe online identities. They encourage creativity! Users must make sure to tag PRIVATE WiFi so it shows up on the company’s wall.